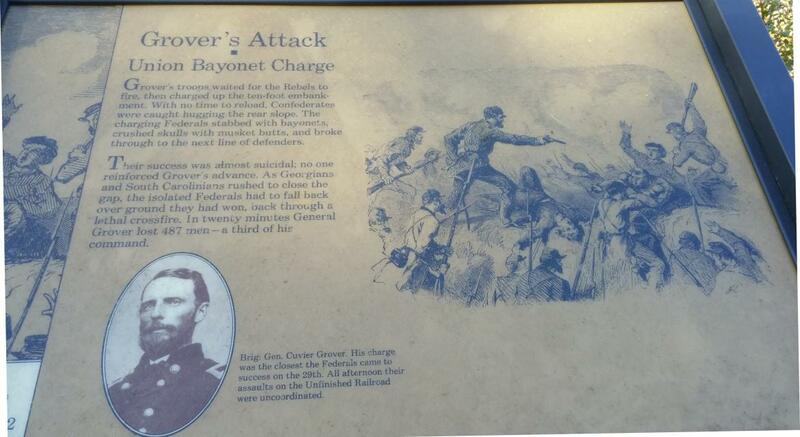 Grover's troops waited for the Rebels to fire, then charged up the ten-foot embankment. With no time to reload, Confederates were caught hugging the rear slope. The charging Federals stabbed with bayonets, crushed skulls with musket butts, and broke through the next line of defenders. Their success was almost suicidal; no one reinforced Grover's advance. As Georgians and South Carolinians rushed to close the gap, the isolated Federals had to fall back over the ground they had won, back through a lethal crossfire. In twenty minutes General Grover lost 487 men - a third of his command. This marker can also be identified by its HM code. You can use the hashtag #HMR5P in tweets, and any other place where you might refer to this marker, including when searching on this site.